My wife (Anne) and I started our off the grid homestead in 2001. Although we are Canadians we were working in Maine at the time and were amazed by some of the beautiful homesteads in the New England states. We found a piece of land on the Saint John River in New Brunswick, Canada and began building our home. Even with grid power only 800 feet from our home we decided to start building using a small wind turbine, battery bank, inverter/charger and a gas generator. The first few years were tough. We were always short on electricity and since we built our entire home ourselves, things didn't always work they way we thought they would. Skip ahead twelve years, we have three children (two from Haiti and one biological), a near finished home, a large solar power system, large garden, a few animals and a lot of stories. 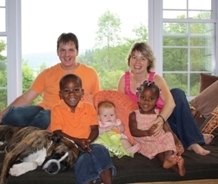 To learn more about us, our adoption from Haiti, our homestead or our power system go to SolarHomestead.com or click the photo above. We are most interested now in building an underground greenhouse, adding bees and more animals to give us more independence. We both enjoy the information provided here on The Walden Effect. Thank you!